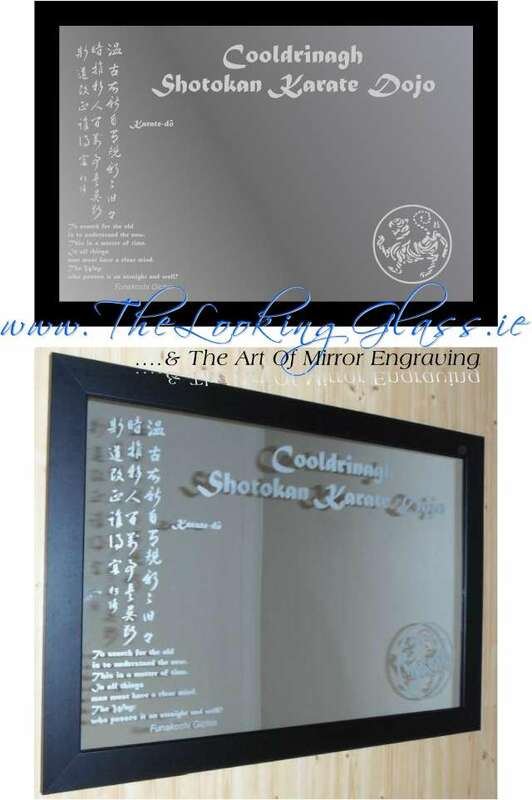 This mirror is a gift we created for Agnes in Celbridge, Co. Kildare. She wanted to combine the name of her karate club and it’s logo, with some inspirational words from Funakoshi Gichin, the founder of Shotokan karate, as a presentation gift for her friend. Via a series of design proofs, we settled on this as the best design, which left plenty of room to be used as a regular mirror, as well as the unique gift it primarily is! The Chinese lettering and words on the side were supplied by our customer and reproduced faithfully. I got the mirror today. Thanks very much… it’s brilliant!